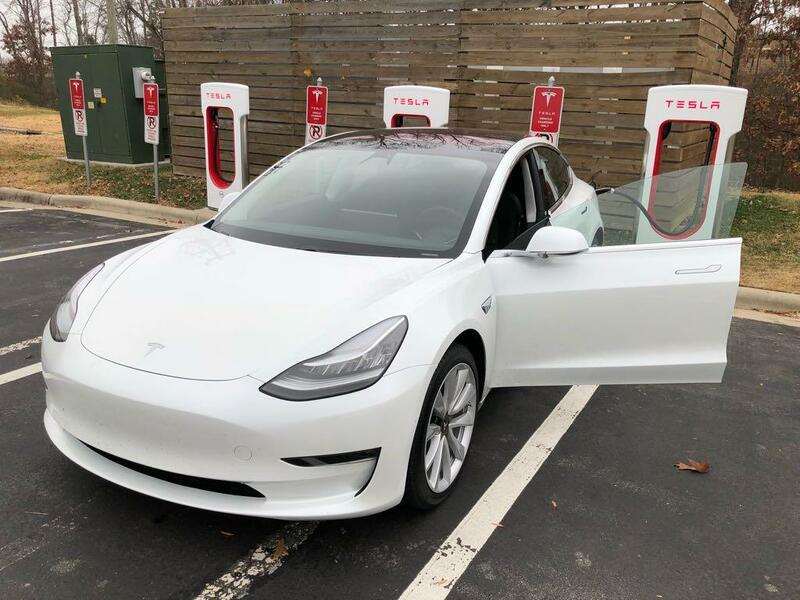 Starting a thread to discuss North Carolina Model 3 reservations, invitations, sightings, deliveries and state and local issues affecting Teslas and EVs in general. There are a few other resources available such as Facebook groups and Google groups/clubs, but those aren't specifically targeted towards Model 3. My own reservation was 3/31/16 at the Raleigh store. I was probably 150 people back in line...about 60-90 minutes after the doors opened. Non-current owner. Currently showing Dec-Feb delivery, but I take that to mean March, or more likely early April. I'm in Greensboro. Reserved online on 4/1/16. Great idea. Looking forward to the first TM3 sighting in NC. I'm late to the party (7/14/17) so have a May-July, 2018 window. I will wait for AWD, October - December, 2018. My RWD dates are the same as yours. My estimate is March-May '18, but if the tax credit is eliminated, I'm going to wait for the AWD P version. Really hope the Raleigh store gets a 3 in so we can see it in person soon! 2nd in line at Raleigh. 3rd in line was an S owner...surprised he camped out, already having one. December-February estimate last I checked, so February. Waiting for white seats, if it's still a thing to wait for by then, hoping not. If the Raleigh store doesn't have a 3 by the time I get mine, I plan on hanging out at the store occasionally on weekends to give folks a look. Five minutes away! Lucky that way at least. Would be nice to know who this mystery person is. All we know for sure is that they like Brixx pizza! Also a late bloomer (2 Jan 2017). My window is May-July 2018 as well. Driving Greensboro to Savannah weekly... my delivery can't come soon enough. Reserved online on 10/31/16 in Rolesville NC. My window was May - July 2018 but now says Aug - Oct 2018. The waiting is a killer. My Tesla now shows Jan-March for me too. My AWD dates did not change. 2nd in line at Raleigh. If the tax credit doesn't get cancelled before, I'll most likely roll the dice on that and go with first production - estimated Dec-Feb. Otherwise, I plan to wait for white interior in RWD. I think Nissan is making a huge mistake by not including battery thermal management. I'm sure the same thing will happen with the new leaf as the old one. That almost seems outright illegal to say your car gets 160 miles of range, but a short few years later will get 100. A bit OT, but I honestly don't think it has much to do with the lack of active thermal management, but rather just a real lousy battery chemistry choice. I very closely monitored my LEAF's battery loss as I was approaching the warranty cutoff (I missed it by 1490 miles!) and found that the largest contributor to battery loss was simply when it was parked outside on a hot day. And when it's just sitting there parked, it doesn't really matter if there's active cooling or not. Not to say active cooling would not be a good thing for the LEAF. I now have a new LEAF capable of making it to Charlotte. Because of the spacing of CHAdeMO chargers, it requires two stops (Burlington and Salisbury). Even on just a mildly warm day, the second charge puts the battery temp into the red zone and I lost an acceleration bubble until I got back on the road and the airflow got it back down. In a car capable of truly long distance travel, this would really be a flaw. Saw a black Model 3 today behind the Raleigh Service Center. Was able to walk around and look in the windows. Rather unassuming (at least in black), but maybe that's as compared to the dramatic T on the front of the S and X or as compared to all the vents and (fake) grills on any other manufacturer's current models. I'm not knocking it - I do like simplicity, especially when it comes to hand washing! Confirmed I'm going for either red or white for mine. Jumping in the car to head over now...woo hoo! Been dying to see one. Just west of Asheville here. Stood in line in Charlotte, about #20 to order. Hoping I can get mine before a road trip in April. Apparently day 1 reservationists/owners have been invited to configure their Model 3s so in about a month there should be several of them tooling around the streets!